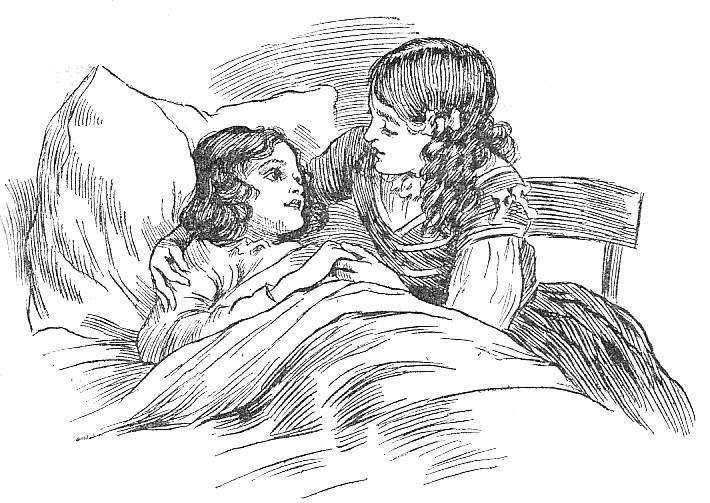 The costumes and appearances of the two upper-middle-class children on the sofa are perfectly consistent with Copping's colour lithograph "The Runaway Couple" or, as in his volume Characters from Dickens (1924) "Mr. and Mrs. Harry Walmers and Cobbs," except that here the illustrator has added a miniature parasol to emphasize Norah's diminutive stature. Dickens, Mary Angela [Charles Dickens' grand-daughter]. Dickens' Dream Children. Illustrated by Harold Copping, E. M. Taylor, and M. F. Taylor. London, Paris New, York: Raphael Tuck & Sons, Ltd., 1926.